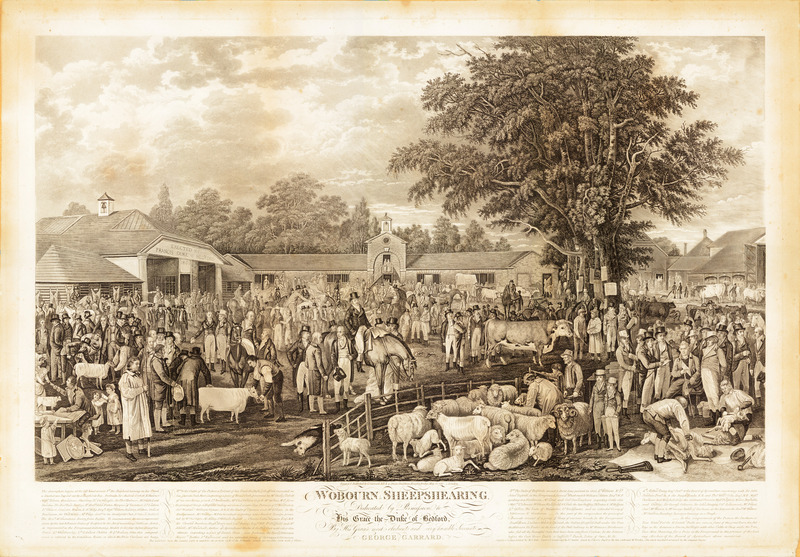 The Woburn Sheepshearing print of 1811 is a famous image, and original copies hang in several houses in Eversholt. I [EJW] have always wanted to publish a good copy of the picture, but the originals are all encased behind glass, making photography difficult. I had intended to ask Sally Abbis if I could unseal her copy, but she died before I had a chance. However, Richard Abbiss very kindly lent me her copy shortly after her death, and gave permission to remove it from the frame for photography. Thank you, Richard. As far as I know, there is no Eversholt connection at all to the image, but it’s still a nice picture. There’s a copy in the British Museum, the National Trust has one, and originals and copies are for sale commonly online, but this may be the highest resolution digital copy available for free. Here is a jpeg version of the print. This is a 27Mbyte jpeg, a 110 megapixel image, so some computers might struggle to view it. Click for the big version if you dare! You can right-click this small image here and download the jpeg and view it locally if you want, rather than just click and hope the browser can handle it. I [EJW] place this copy in the public domain. That’s 9 hours of my life I’ll never see again 🙂 There are details of how the picture was made at Photographing Big Documents. The brown shading is present on the paper copy, which was, long ago, folded into three. The image above is slightly contrast-enhanced to make up for fading of the print. I do have the 2Gbyte photoshop file still if anyone would like to try and make a better version. Leave a comment if you’d like access. This image below is a reduced-resolution version of the one above, one quarter the number of pixels. It might be more suitable for some purposes. It’s a 9 Mbyte jpeg. Click for the big version, or again, right-click and save. The text below is a direct transcription of every character (I hope) of the text in the print above, retaining the capitalisation, punctuation, spelling and spacing. The description begins at the left hand corner. 1st the Shepherd1 leaning on his crook. A Southdown Tup, led out by a Shepherds2 Boy. Portraits, Sir Andrew3 Corbett, H.Hanmer4, Meſsrs. Reeves5, Honnibone6, Stubbins7, Dr. Cartwright8, Sir Thos. Hanmer9, Mr. Smith10, Lord Dundas11, The Revd. Bate12 Dudley, Rt. Honble. John13 Foster, Marquis14 of Tavistock, Ld. Ludlow15, Ld.Thanet16, Conyers17, Towers18, & Rt. Bing19, Esqrs. Meſsrs. Wilson20, Buckley21, Walton22, Stone23 & Runciman24, Sir Thos25. Miller, Mr. Fary26, Sectry. to the Smithfield Club. Dr. Yates37 of Bedford. The Revd Mr. Smernhove27, Envoy from Ruſsia. To commemorate the encouragement given by the late & Present Dukes of Bedford, to the Art of modelling Cattle, an Artist is represented in the Foreground distributing Models to the four Infant Sons of his Grace, Ld. Wriothorsley28, Lds Edward29, Charles30, & Ld Francis31 John, this compartment is releived by the Exhibition Room, on which the Prize Carcases+ are hung. 2nd In the Centre of the Picture a Portrait of his Grace the Duke32 of Bedford, mounted on his favorite Irish Mare, inspecting a piece of Broad Cloth, presented by Mr. George33 Tollett of his own Merino growth. Ld. Somerville34, Mr. Chas. Gordon35 Grey & Mr. Curwen36 M.P. form the principal Group. a Shepherd38 leading out a new Leicester Tup. Portraits of Ld. Winchelsea39 Sir Watkin40 William Wynne, H.R.H. the Duke of Clarence41, and Mr. Elman42. In the Background, Mr. Northey43, M.P. on horseback inspecting some Swedish Turnips, presented by Mr. Thos. Gibbs, M Astley44, Ld. William45 Ruſsell. Charles Callis46 Westurn Esqr M.P. Sir Charles47 Bunbury, Hugh48 Hoare and Lee49 Anthony Esqrs. M.P. Ld Sheffield50 and Mr. Sitwell51, Mr. Marshall52 Author of Agricultural Works, & Sir Thos.53 Carr with other Gentlemen inspecting a pair of Scotch Oxen. also Portraits Sir Harry91 Fetherstone Major90 Battin Ld Egremont89 and an extended group of Carriages & Horsemen. 3rd The Duke of Bedfords second & third Sons painted in 1805. Ld William54 & Ld. John55 Ruſsell, in the foreground, Samuel56 Whitbread & William57 Adam Esqrs M.P. speaking to a herdsman. Mr. Isted58 and Coll. Cunningham59 inspecting Cattle. Also Meſsrs. Lechmere60, Westcar61, Wakefield62 & Crook63, the late Godfrey Thornton64 & Mr. Higgins65, Ld. Oſsery66, The Duke of Manchester67, Ld. Bridgewater68, and an extended Group of Noblemen and Gentlemen. In this part of the composition the principal Animals consist of a group of Sheep of various breeds. In the Foreground SouthdownA, LeicesterB, WelchC & SpanishD, the Oakley HerefordE Bull under the Trees. The Wobourn Ox Feeder at the head of the Bull talking to Mr. Westcars Herdsman who fed all the beautiful Oxen that have been sent from Creslow. In the distance before the Cart Horse Stable, a SuffolkF Punch, Yokes of Oxen, &c, &c.
4th Arthur69 Young Esqr. Sectry to the Board of Agriculture, conversing with Sir John Sinclair70, Pred. B.A. Sir Joseph71 Banks, K.B. and Thos. Willm.72 Coke, Esqr. M.P. Meſsrs. Overman73 and Monyhill74. Davy75 the celebrated Chemist. Meſsrs. Pickford76, Moore77, Reynelle78, and Oakley79, Sir George80 Osbourne, Sir John81 Sebright, Coll. Beaumont82, Mr. Praed83, Junr. Mr. Waters84 & Mr. George Baker85 of Durham, in the distance the Revd. Mr. Hutton86 Mr Salmon87, Resident Surveyor, leaning on a Plough. In this compartment of the Picture the Durham or Tees WaterG Fat Ox & ScotchH Bulls are seen, in the front of the great Barn, the fat Pigs in the distance, a Devon fat Heifer, with other Cattle & Sheep under the Trees. Two Men Shearing for a Prize in the Foreground, in the presence of the leading Members of the Board of Agriculture above mentioned. The numbers over the names refer to numbers on or near each of the Portraits, which are readily seen with a Glass. The whole touched and arranged by the original Painter. The table below lists all the people referenced above, expanding their names. Every person referenced appears to be male. Sir Henry Bate Dudley Rector, among other things. 1745-1824. Once land agent to the 5th Duke. William Lee Antonie MP for Bedford. 1764-1815.